Not for the reasons you might think. 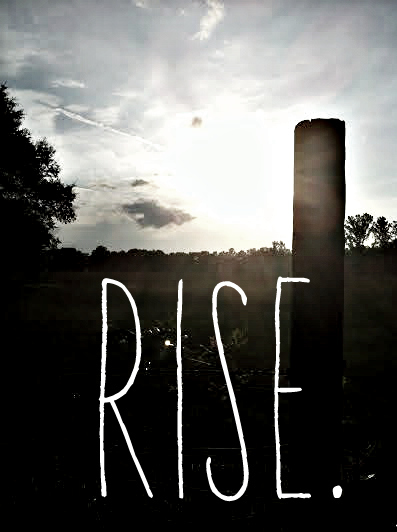 Do not rise because of feared consequences. Do not rise because you think being tough makes you smarter (it doesn’t). Now that we got the reasons not to rise out of the way, let’s get on with the good stuff. I have been a go-getter, a do-or-die kind of gal. Quitting is for losers. If you’re not first your last thinker. A wear myself into the ground swatting and fighting for all the wrong reasons. Good intentions at the core, but some serious exhaustion with nothing to show as the result. Years and years of this, y’all. I’m not nearly afraid of quitting anymore. While I absolutely adore responsibility and doing what you say you are going to do (if it is serving you well), the things that don’t serve can fug off! My new rise and shift is for the great life. It’s for ebb and flow. It’s for latching on to what’s speaking from my Soul and allowing a whole lot of grace to cover the process. It’s true what is said about following your heart and desires above all. Because not every thought you have is the truth – but the heart is true all the time. Right now I desire to be free and open. Not constrained. I need a little whim and not-so-seriousness in the every day. I am wild and primal at heart afterall: with a body and mind that is God-Given for survival on this earth. My mind and heart is craving freedom from reliance to do what I need to do. I can do this. I was born to, actually. I crave endlessly the wiggle room and peace of ME! Of me being able to take care of myself. I want joy, resilience, and rest. I want sunrise without dread. And friends, that’s what I will have because I have everything to gain from what my Soul is telling me. I will be listening this time. Because. My Soul is God and people, that’s where I want to go and what I want to touch in every moment of every day. Why am I doing this every, single day? I want to be doing something else worthwhile. Why is this bothering me so badly? Why has all my energy been used to fight things that don’t matter. Why am I not following my heart and gut? I have been sitting back, not rocking the boat, afraid that I can’t do the things I want on my own, fear of failure, fear of the future, and fear of what others will think about my decisions. But deeeep down, I know that I will figure it out. I AM READY TO ROCK THE BOAT. I intend to do this by following my core desired feelings. This comes beautifully from The Desire Map sermons. It is probably the most simple thing I have ever heard, but I have for so long squelched my desires and been very self-restrictive that I can no longer express my desires. This is all about to change. I am going to shift. I am no longer going to live reactive. I will be trusting my gut, my heart, and my intuition. I want to say goodbye to the quiet, obedient me and say hello to the new, authentic me. At any cost. And for me to live the way I want to feel, I must do and act in harmony with those top 5 desired feelings. I know that I can’t wake up tomorrow and all the sudden everything I want be right in front of me, because truthfully what I envision is very, drastically different from my life today. My shift will include doing less of what I am doing now and then actually living and doing more of what I want to do. So what about you? Do you live based on the way you want to feel or do you live reactively like I have been doing for so long doing things that you really don’t want to do?